For most people visiting Catalonia and its capital, Barcelona, wine isn’t often the first thing on their mind. Most of us head to the beach, shop, enjoy the nightlife, visit museums or meander about the ancient cities and villages that define the history and culture in this Catalan part of Spain. For those who make it up to the northeast of Catalonia, perhaps to visit the Dalí Museum in Figueres or beautiful nature of Cap de Creus, you’ll find yourself in a whole different world from Barcelona. In the midst of the two Empordà counties, you’ll see vineyards spilling out across the plain and up the sides of the mountains. Winemaking in this region dates back at least 2,500 years and has seen a massive resurgence in the last decade. For those looking to discover some fantastic wines in between absorbing sun on the Costa Brava, there are no end of options. With over 70 different wineries in the area making every style of wine imaginable, it’s not out of line to say that there’s something for everyone. After all, the grapes love the area for the same reason people do: the sun. So, why not have both? The workhorse grapes of the region include Grenache and Carinyena, but a number of international varieties (aka French) have popped up along the way including Merlot, Cabernet Sauvignon, and Syrah. But, some older different grapes such as Hairy Grenache, Grey Grenache, and White Carinyena have stuck along for the ride. 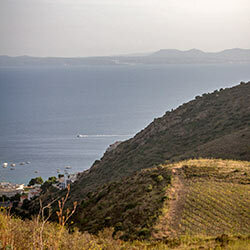 Please peruse more articles about the wines of Empordà.